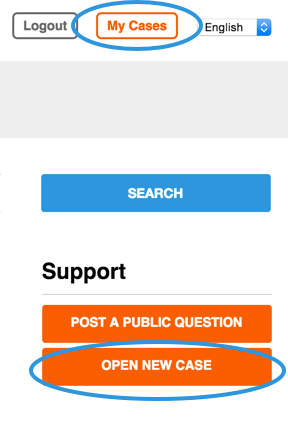 When you need assistance, simply open a new case from the Support homepage. Including detailed information provides the context and background to quickly distribute your case to the most appropriate Support member and help you most efficiently. Click Open New Case to open the case form. From the drop down list, select the Product you are having trouble with. Note: Your case can only include questions about products for which you have a Support subscription. For example, if you have support for RapidMiner Studio, but pose a question about RapidMiner Server, our Support team is not able to answer the RapidMiner Server question. You can, however, post the RapidMiner Server question in the public Q&As section. Process Design* Process design, best practices, processes optimization, etc. * Note that the process and report design options provide assistance (for example, a small sample process), not full consultancy. Level 1 Critical Business Impact. Licensee’s use of the software is stopped or so severely degraded that the Licensee cannot reasonably continue work related to the software and no workaround is available. Level 2 Substantial Business Impact. Important software features are unavailable with no workaround available. Licensee's use of the software is continuing; however, there is a serious impact on the Licensee’s productivity. Level 3 Some Business Impact. Important software features are unavailable, but a workaround is available, or less significant features are unavailable with no workaround. Licensee's work related to the software has a minor loss of operational functionality or implementation resources. Level 4 Minimal Business Impact. Licensee requests information, an enhancement, or documentation regarding the software but there is no or a minimal impact on the operation of the software. Licensee's use of the software is continuing and no work is being materially impeded at the time. Note that not all issue types are available at each level. For example, there is no feature request with a critical business impact. Enter a Subject. Make the title specific enough to help you recognize the subject of the case. What is your situation and what are you trying to do? What did you do just before the problem occurred? Describe every step that seems relevant. Did you get an error message? Copy the exact message into the description. Complete the CAPTCHA and click Open Case. A Support representative will contact you as quickly as possible, choosing the most suitable media for providing assistance. RapidMiner may respond via email or telephone, or may agree on a screencast solution to quickly solve a problem collaboratively. Click My Cases to browse all your existing cases, both active and closed. The resulting case list includes the subject, last update date, and current status of each case. Click an entry to access the case history or, for active cases, to provide additional information. New Automatically assigned when a case is first created. Open Support has opened the case and reviewed the type and level settings. Pending Support has sent a response. Further information or a follow-up from Support is required. When you reply, the case reverts back to Open. Resolved Support has sent a response. The issue has been solved and it is believed that you do not require further assistance. If you reply, the case reverts back to Open. Closed Automatically assigned when a case has been in a Resolved state for two weeks. Once a case is Closed, the status cannot change and the case becomes read-only. If you reply to a case after it is Closed, Support opens a new case.